Looking for a cabin to take your breath away? Come stay at "Breathe!" On the main level, there is an open-concept living room, kitchen/dining area, 1 private bedroom and 3/4 bathroom. The upstairs/loft, with cathedral ceilings, is spacious and has a catwalk path leading to the second-level riverside deck. 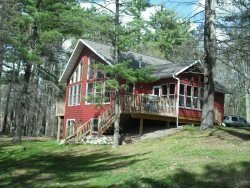 Attached to the main-level deck there is a screened in porch that will allow you to enjoy the beautiful Northwoods breeze. Whether you are on the main-level deck or second level, you can enjoy overlooking the beautiful scenery of the Flambeau River!